I was bitten by the dog show bug when my Mom bought me a Japanese Chin when I was 12 years old. I had been begging for a dog and my Mom and I read countless books together and decided that the Japanese Chin breed was the only breed for us. Chins were very rare in the early 90s and finding one was almost an impossibility, but with my diligence we happened upon one and my Mom bought him for me. A few months after I had Ureshii, a flyer at school was passed around advertising an AKC Fun Match. I had no idea what AKC was but I knew I had an AKC registered dog. My Mom, Ureshii and I went to the match, I entered myself in junior showmanship. I had no clue what I was doing but I managed to place 4th in a class of 5. I was HOOKED! My passion for dogs and showing them only blossomed and I worked for 2 different kennels to learn more about dogs of different breeds. I will forever be grateful to George and Sherry Howes of Hiswill Hounds and Chad Howard of legendary Chaseland kennel. These folks were like my second family and not only taught me about dogs, but about life. At 18, I entered college and the student life drew me away from dog shows for many many years. Even still, I always had a Japanese Chin or 2. They were rescues and I never showed them, but longed to someday get back into showing dogs. Fast forward to 2009, I met my future husband Gabe and his Cane Corso. Gabe had an incredible Cane Corso named Jack and after Gabe and I became serious in our relationship, I started researching the Corso breed. I asked Gabe if he'd be interested in trying to show Jack. To my delight, Gabe said "Let's do it!" and I was able to complete Jack's championship. We then decided to campaign Jack with handler, Amy Rutherford for 2 years. 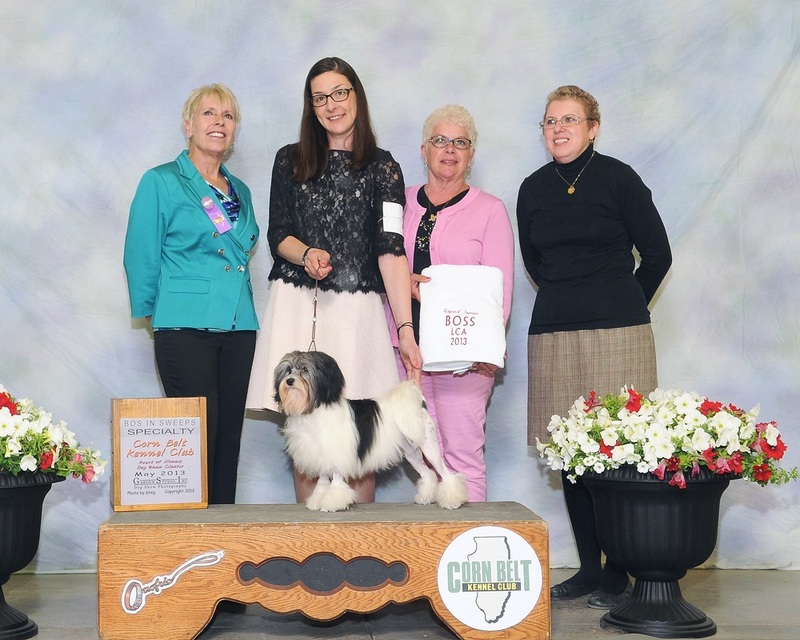 Jack became the #3 Corso in the country 2 years in a row and had numerous big wins at all the major dogs shows, Eukanuba, Westminster and he even won the CCAA National Specialty. Despite all the success in the Corso world, I still felt like something was missing. I yearned to get involved in a smaller breed of dog that would live well with our Corsos. I started doing research, while I loved my Chins, I wanted a breed that was more outgoing and would excel at sports like agility and tracking. It was at the Eukanuba show in 2011 when a bunch of friends and I were watching Portugese Water Dogs, one of them remarked that one of the puppies "looked like he was a Lowchen moonlighting as a water dog." This seemingly inconsequential suggestion made me read up on the Lowchen breed. The breed sounded perfect, non-shedding, happy, trainable and outgoing. What more could I ask for? 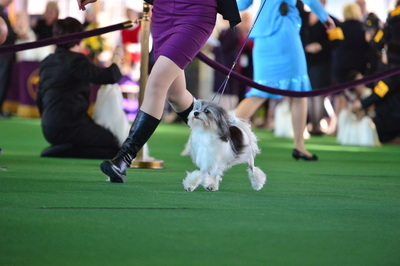 Convieniently, I was at one of the largest dog shows in the country with an extensive Meet the breeds event. I went to the Lowchen booth and fell in love. The more I researched the breed the more I fell in love with them. 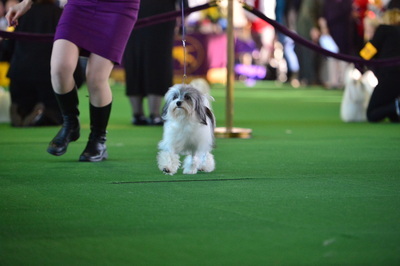 However there are virtually no breeders within 1000 miles of the San Francisco Bay Area. A part of me was nervous to add one to our household since I had not spent much time around the breed and none of our dog show friends had any experience with the breed. I looked up a breeders list via the Lowchen Club of America and there were very few listed. I contacted quite a few of the folks on the list but the person I felt most comfortable with, was Gillian Robertson of Bihar Lowchen (now Tapestry Kennel, registered). Gillian and I exchanged countless emails and when we talked on the phone, I knew she was going to be my mentor. It through a few turns of events that Gillian entrusted me with her pick female puppy from a very well thought out and important breeding. That puppy is Beatrice aka Tapestry's The Beat Goes On at Potrero. I waited over a year for darling Beatrice but she is everything I ever wanted and had hoped for in a Lowchen. Everyday she makes me smile with funny personality. She is not only conformationally correct, but her temperament is correct. She is my angel, my heart dog, a completion of my world. I will forever be grateful to Gillian for entrusting me with Beatrice. 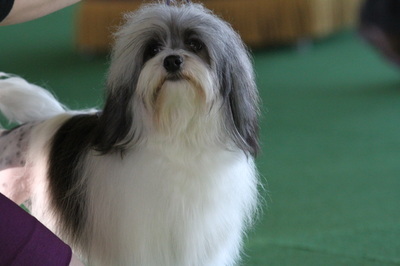 Gillian is my mentor in the breed and with her guidance, I hope to share this breed with more people. This story is a work in progress as is everything in life, but I know this breed has stolen a special piece of my heart and I feel a duty to help promote and develop this best kept secret of a breed.